This is old version PicsArt 5.32.3 apk for Android, you can install it if you want to downgrade or install old app. 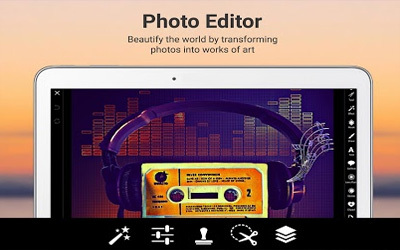 It is top Photography apps from PicsArt. You can add so many elements to your pictures. It is allowed to make a simple editing pictures to make it looks natural, or if you want a complex editing. The app will also give you powerful equipment’s. It contains so many mode and menu that will support your activities during image editing. You can have hundreds of photo editing tools through the menu. It is also available for you to custom your own effect and filter. It can be adjusted to the original pictures so you can maximize the result later. Some available animated gif and video features will also give you many advantages. The presence of text, image and overlay option will also give you the opportunities in adding additional information for the photo itself. PicsArt for android can be the best partner for your mobile image processing. We’ve made collage making smoother and editing more flexible. You can now brush on and off blur in the Tilt Shift Tool, and undo/redo your changes in the Curves Tool.